To take the first step towards this goal, we hosted our very first Community Meeting at Figure 8 Studio on the evening of June 27, 2018. 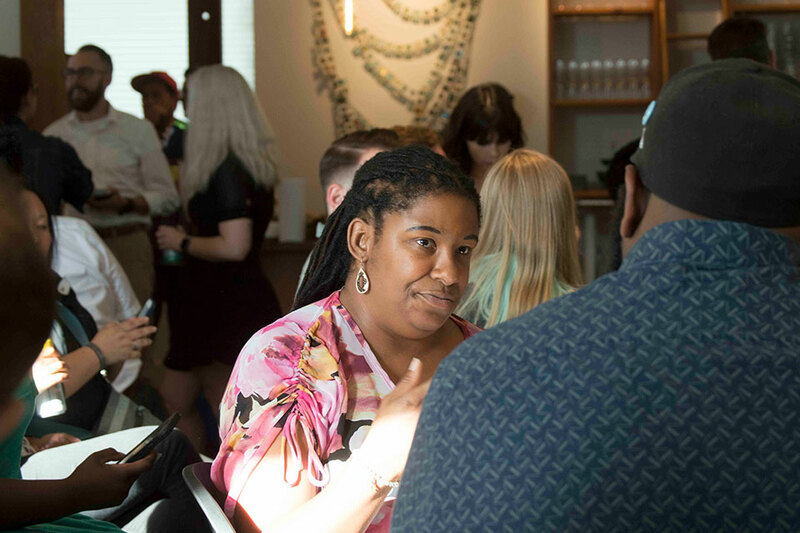 An audience of over 45 creatives showed up to learn more about AIGA, to meet other members of the community, and to provide their feedback and insights to help better shape the chapter. Attendees had the chance to mingle and interact before the presentation. The evening started out with a social hour, where attendees could eat pizza, mingle with other members of the community, and meet members of the board. Following the social hour was an informative presentation led by board members Jen Arevalo, Jason Kellum, and Cassie Deogracia, as well as Advisory Board member, Russel Quadros. 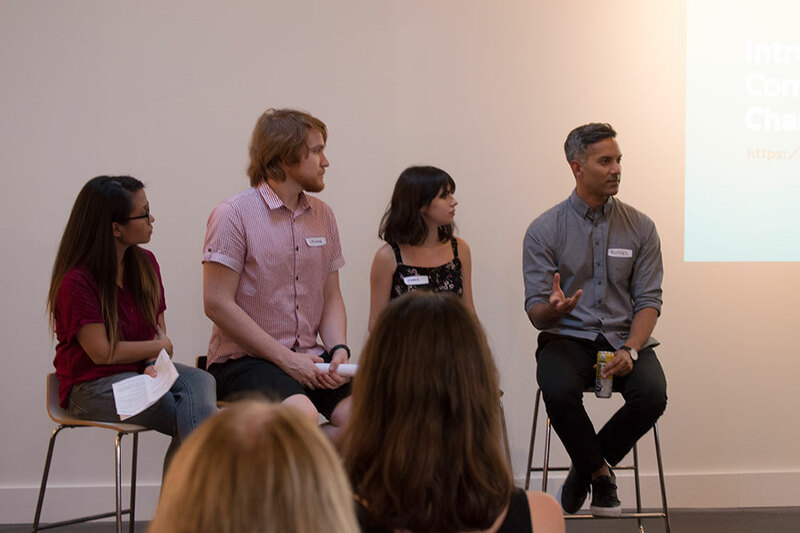 The presentation outlined AIGA Jacksonville’s purpose and goals, detailed membership, and recapped all of the chapters programming over the past year. The presentation also included survey results which provided helpful insight to the demographics and wants and needs of Jacksonville’s creative community. Jen Arevalo, Jason Kellum, Cassie Deogracia, and Russel Quadros lead the presentation. Following the presentation, a Q&A session was opened in which attendees could ask members of the board any questions they had regarding the chapter, as well as provide insight, ideas, and feedback. Participants were eager to share their thoughts and find out more information about getting involved. How is your programming decided? What are we [AIGA Jax] doing to help mid-level professionals advance in their career? 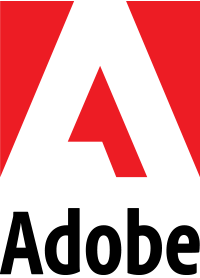 Can you [AIGA Jax] include more programming in the St. Augustine area? What are we [AIGA Jax] doing to leverage more professionals in our community? Any questions and feedback the board was unable to address at the event are being answered via AIGA Jacksonville’s Community Slack Channel. David Porter, one of the founding members of AIGA Jacksonville, attended the event and shared insightful information with the group. David Porter, one of the founding members of AIGA Jacksonville, also attended the event and shared some insightful and inspiring information that he has gathered throughout his years involved with AIGA, with the community. Members of the community had the chance to ask the board questions and provide their feedback. 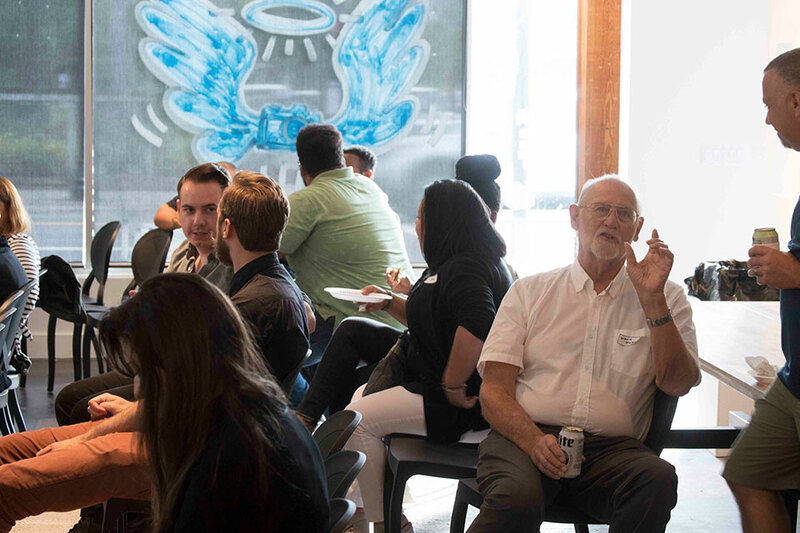 This event was the first of its kind in AIGA Jacksonville’s 30 years as a chapter, and we were extremely excited to see the community’s interest. 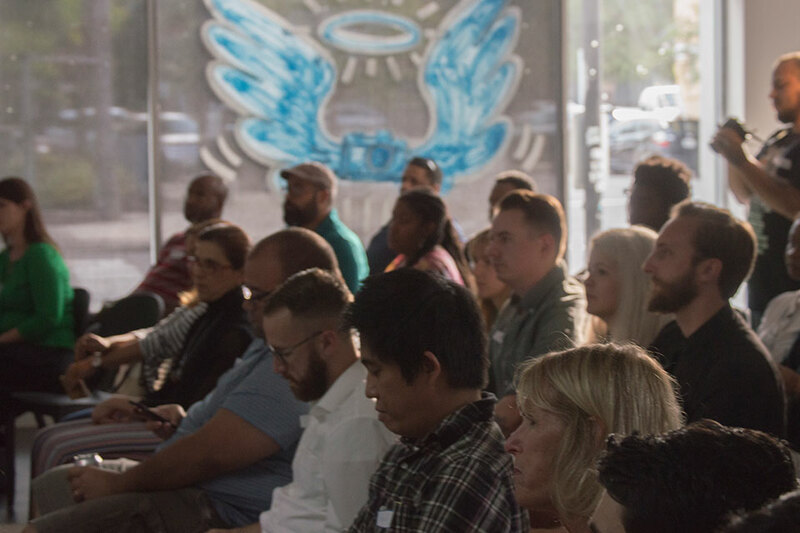 In the future, we hope to host Community Meetings on a more frequent basis to ensure that we’re meeting the needs of Jacksonville’s creative community. See what you missed by viewing our presentation deck. Special thank you to Amy Ploss-Samson of Figure 8 for opening her studio.